Portable amplifier for schools: punchy, powerful and practical. Our rugged school PA system is perfect for filling a hall or playground with sound that will get you heard. This is the most portable unit in our range of amplifiers for school. With both internal rechargeable batteries and integral trolley, you can take it with you outside or from location to location with no effort. The Dance Combo portable amplifier for school comes with a free iPod lead, battery charger/power supply and remote control for CD/USB/SD. Use the option boxes above to add one built-in receiver for radio mics which will allow you to use an additional wireless microphone. Without selecting this option you will still be able to use wired microphones. Top 3 reasons why the Dance Combo is the preferred portable amplifier for schools throughout the UK. Volume and clarity to keep people entertained in a space up to the size of a medium hall. You’ll be able to use in a few seconds. No manual! It won’t let you down on those critical moments. Rugged, practical & portable. This compact portable amplifier is perfect for every application in schools. It's so simple to use with genuine impressive results. It will fill most drama studios, assembly halls, playgrounds and sports fields with sound on its own, but it can also be connected to one or two of our 430 speakers to double the power and distribute the sound. 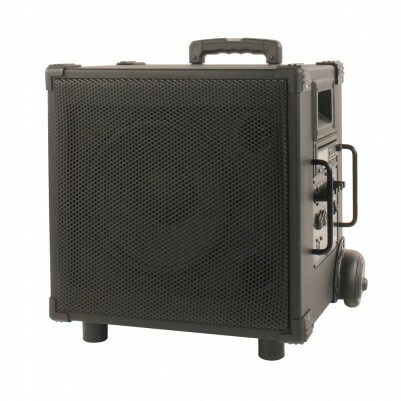 The Dance Combo portable amplifier is able to fill a whole class, a small hall or a medium hall. You can use it in the school for both voice reinforcement (PA, assemblies) and sound amplification (Dance, P.E.). Hall PA, Assembly Hall Dance, P.E. The clarity of the voice and bass response has impressed many critics of audio equipment. It does truly enhance the performance and the user's credibility by being heard clearly and using a professional quality British made audio.